Shirley Mae Springer Staten and Josh Lowman with Perseverance Theatre visit KNBA. As Heard on Morning Line: Cyrano de Bergerac & the Winter Bear? Perseverance Theatre General Manager Josh Lowman and Community Engagement Officer Shirley Mae Springer Staten sharing the love of theatre and National Poetry Month! In addition to information about when the shows are playing, the lovely and talented Shirley Mae Springer Staten shared her favorite poem in honor of National Poetry Month. Click here to hear the interview and Shirley Mae Springer Staten reciting the poem. Once again Perseverance Theatre's presentation of The Winter Bear is showing in the state of Alaska, with upcoming public performances in Anchorage April 8th and 9th, and Kenai in the works for future dates. The show also travels to schools and various service programs throughout Alaska. The show has been professionally produced since 2010, with origins as a student-production in Fairbanks since 2008. 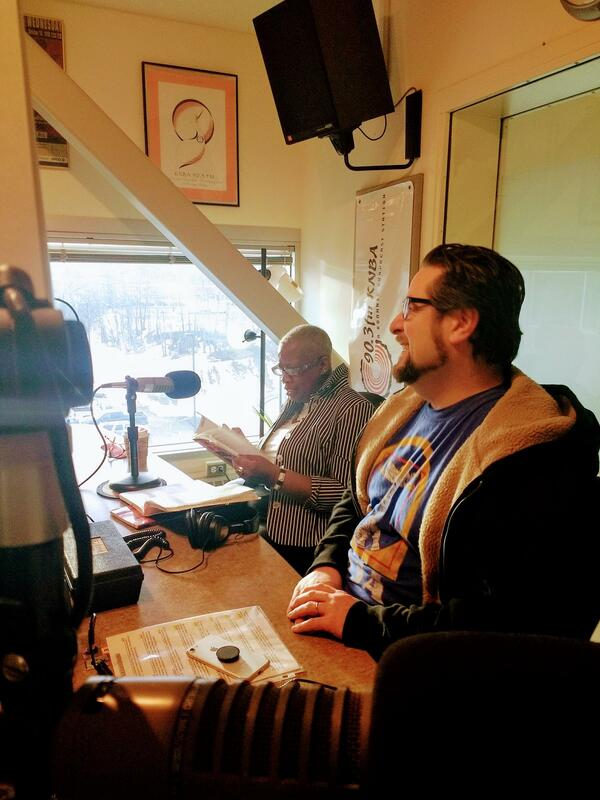 Actor Frank Henry Kaash Katasse, Director Randy Reinholz, and Art Director Art Rotch came by to share the play, William Inc., which opens tomorrow with a pay-as-you can preview. William Inc. is written by Alaska Native playwright Lucas Rowley and features lead character William, a therapist and recovering addict himself, who lives on the Kenai, coping with daily life pressures by forming an ANCSA corporation in his head.